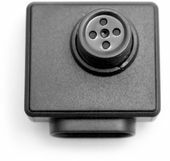 Button cameras are hidden cameras disguised to look like a shirt or accessory button. They are a popular choice for covert recording because they are so easy to hide on your person. This lens easily replaces the normal button of a dinner or sport jacket and because this kit includes so many buttons the Wired HD CMOS Button Camera is sure to fit in perfectly with any of your clothes. The Wired HD CMOS Button Camera is the most recent upgrade to a great line of lawmate buttom cameras, featuring an image sensor that is over 2x larger than previous generation button cameras. Record superb high-resolution images and video. The high-quality CMOS image sensor connects with one plug directly to a DVR with no need to any 3rd party external power source.